MyProgressCard team have created standard mock tests that resembles real tests, both in terms of content quality and exam experience. It is significantly designed to provide you Free Mock Test series for GATE that give real-time exam feel and helps you perform better in the actual Exam. Just take the test and see where you stand - it is absolutely free! 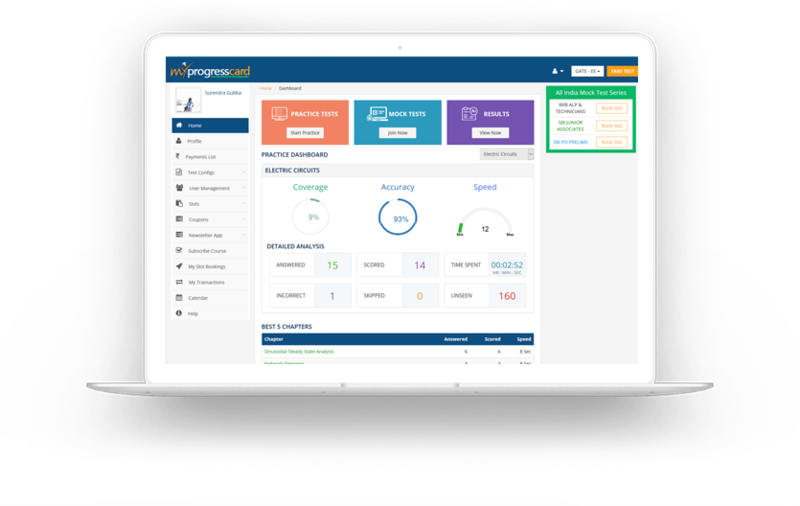 MyProgressCard would give you detailed feedback on your performance and suggests areas where you can improve. Success is all about identifying strengths and weaknesses by going through regular competitive mock tests and revise accordingly. MyProgressCard believes that the best way to achieve success is through rigorous practice. Regular practice keeps you sharp and improves retention. Unlimited practice on MyProgressCard lets you fine-tune your skills using the detailed feedback. You can make endless practice on each subject and get instant performance feedback. Stay ahead - Never lag behind! This is an awesome practicing tool, suitable for competitive exam preparation. While I was practicing on it, it made me feel that I’m in exam hall. Thumbs Up! It helped me to know my speed and accuracy level of my progress. Thanks MPC. India's No. 1 Test Engine..offering free unlimited mocks test series in all major domains. Thank You! GATE (Graduate Aptitude Test in Engineering) is a national level entrance exam for admission to PG courses in the field of engineering and technology. Candidates can get admissions into M.Tech./Ph.D. programmes in IITs , IISc, IISERs and other reputed institutions through GATE score. Every year, GATE is organized by the seven zonal IITs and an IISc on rotational basis. GATE 2018 Dates will be notified in July 2017.